The following is a guest post about tips to help save for retirement. If interested in submitting a guest post, please read my guest post policy and then contact me. Before you opt for retirement, you need to come up with a comfortable retirement plan that will sustain your life span. In this content we’ll discuss steps and tips that will help you create a bright future for your life. Your low income should not be an obstacle for building your future retirement: It’s a challenging task to save for your retirements especially when your paychecks are minimal to cover your expenses. But there are many ways of breaking through with the small income. 1. Get a job with super retirement benefits: Before you decide which job to take, you should analyze their retirements package and how they compensate their employees. According to Sam McPherson a certified Financial Planner of McPherson Financial Advisors in Brooklyn, N.Y. says that a job that offers a retirement plan should be looked harder than the one that does not have a retirement plan. 2. If you’re smart enough, you should take advantage of tax break income. If you want to defer payment in income tax, then you should be saving small amount in traditional 401(k) or IRA. An employee within the 15% tax bracket who saves $2,000 in an IRA or 401(k) will save $250 on their next federal income tax bill. 3. Take advantage of saver’s credit fund. Low income earners who contribute to 401(k) or IRA normally get retirement savers tax credit. Eligibility of tax credit depends with the size of your income and how much you contribute. 4. Spread your risk. As the saying, “Don’t put all of your eggs in one basket,” As a financial advisor, I’d recommend you diversify your portfolio so as to avoid financial problems. The most common diversification that I’d recommend is to divide your portfolio among stocks, forex or binary options. Don’t just stop with bonds and Stocks, look for other strategies to spread your risk among your investment. 5. Make contribution to Roth IRA. Low income earners who are the below tax bracket but expect to earn more in future have much benefits to gain by making contributions to Roth IRA. Based on your current low income, you’ll be able to pre-pay for your income tax via Roth IRA. If you’re a young person I’d suggest that you use Roth account as it will give you time for growth. The benefit of Roth account is that it can help you withdraw your contributions without paying income tax or any penalty for an emergency but you’ll not be able to withdraw your earnings. 6. Keep expenses low. If you need to make very dollar count, then you should keep your costs low. Unnecessary fees can really damage your retirement plan. If you have an investment account, make sure to control the cost that comes with. To be on the safe side with cost expenses, I’d recommend that you choose low-cost index funds. 7. Set up a direct deposit from your checking account. This strategy will help you not to spend like a celebrity. If you’re on payroll, then you should select payroll withholding plan. This plan will help you automate your retirement savings by withholding your paycheck. Once you set it up, you’ll realize how profitable it is. Have you noticed any other interesting tips that might help us save for our retirement? Kindly share your thoughts on the comments below. Thanks a lot and have a Happy Retirement Day! Author Bio: Bill Achola aka (BillyBoy) is on a mission to help good people to make a lot of money on the internet they deserve. If you’re one of them, check out his popular blogpost about earning money online (surprise!) On the next issue Bill will talk about 19 Major Warning Signs You’re Becoming Poor, stay tuned. There are so many peoples lives around us who are getting small wages from job. 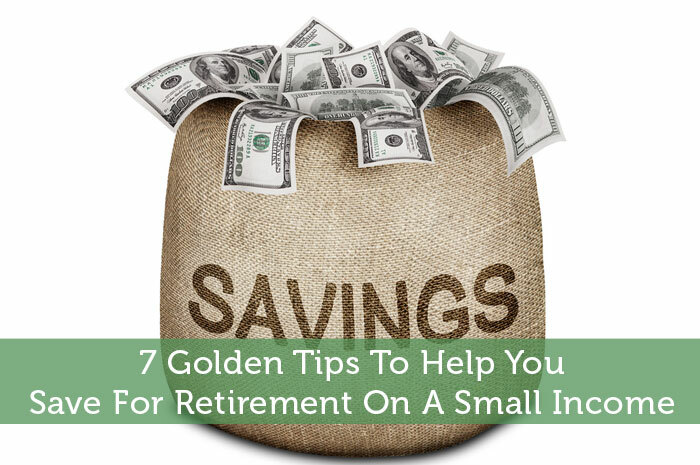 I think these golden 7 tips are indeed effective for them to same for retirement on small income. This is a great come up by Bill and I hope just like me many others will find these tips helpful for them. Thanks Nanny, definitely the ideas will be helpful to the needy. I need to check out that low income earner’s savers credit. I’ve been contributing to a ROTH for several years and I’d be shocked if I didn’t qualify. Yes Stefanie, you better check early before you’re shocked. These are great tips. I see many people that ignore the retirement benefits when comparing jobs. Some times these can be huge differences in where you’ll end up 20-30 years down the road. One other idea could be to form side streams of income and put a large portion of the profits into retirement vehicles. Great tips! I think a lot of low income earners are intimidated by the idea of saving for retirement because in some cases they think that they need every cent they earn. Great tips! When it comes to investment, especially with our retirement fund, it’s really important not to put all our eggs in one basket especially with the current economic situation. We must really diversify our investment, in case one did not work, we still have the other ones to keep our head above water. Great tips…I’m lucky that I have a job with super great retirement benefits. I have a nice pension. I also contribute to my Roth, keep expenses low (though I live in an expensive area) and have direct deposit. Great tips that everyone can apply (although its amazing how many don’t!!). I plan on upping my 401k contribution at the end of the year to help push me down to a lower tax bracket next year. Help me save a little extra money in addition to contributing more for retirement. Whoa. Ankit that’s a great come back, i hope your savings account will boost your retirement account. Love the tips, but I’d also add pick up a side job. Even working 1-2 days per month at a side jobs – evenings, weekends, whatever – will help boost your retirement savings substantially, especially with compound interest. Hey LaTisha, nice to meet you, thanks for the added bonus of compound interest. Great information, particularly considering that many individuals with modest incomes feel like they can’t ‘afford’ to invest. In reality, they cannot afford not to invest to prepare themselves for a comfortable retirement. Good tips to follow for anyone! In my industry it’s hard finding a good 401k, usually no matching, so its mostly up to me to save up for retirement. I think this will be the year I can max out my roth ira finally! I also have the contribution to my savings automatically come out of my bank account every week. I started with $10 – I did not notice it was gone. I am slowly increasing it every couple months, and I still don’t notice! Great tips. I like the point about not putting all your eggs in one basket. Sounds like a safe bet to me. I’m wondering if there is anything like the saver’s credit fund in the UK – I will look into it!